> As I stated the other day, relievers could be hard to come by this offseason, largely in part to the multi-year deals that Jeremy Affeldt and Brandon League have already signed with the Giants and Dodgers, respectively. But the Brewers are certainly going to need at least one relatively-known name in the bullpen by the end of the offseason in order to shore up what proved to be the anchor of the team in 2012. Here’s a list of potential closers who are on the market this offseason. Some of them are far out of the Brewers’ reach because they won’t fit financially, some are middle-of-the-pack (the most likely for the Brewers to sign), and some should be stayed away from for other reasons. You can probably immediately tell who the Brewers are interested in and who they aren’t. In my opinion, the Brewers’ best bet would be Farnsworth, because he’d come relatively cheap and showed huge potential as the Rays’ closer in 2011. It’s doubtful that he’d close for the Brewers, since they seem pretty intent on keeping John Axford in the role, but Farnsworth could fill a gaping hole in the eighth inning if the Brewers fail to sign another setup man (which I’ll get to later). Oviedo- or Leo Nunez, who most probably still know him as- might not be a bad option for that role either, but he hasn’t pitched in the Majors since 2011 because of identity issues and injuries. Soria and Madson also haven’t pitched in a big league game since 2011. Capps, Valverde, Cordero, and obviously K-Rod were all flat-out ineffective in 2012. I suppose I wouldn’t mind Broxton after the 2012 he had, but I have to wonder where his asking price would be. So, of that group, Farnsworth would be the most logical signing for the Brewers. I’ll admit my confidence in him wavered after his 2012, but what more do the Brewers have to lose? Next is a list of free agent right-handed pitchers, ranging from guys with previous closing experience to near no-names. There are far more names on this list that I wouldn’t mind the Brewers bringing aboard. My wish list from this series of names (while trying to stay within the Brewers’ budget) would be Adams, Frasor, Lindstrom, Grilli, and/0r Padilla. Adams, a former Brewer, has become a different pitcher since he left, featuring a nice cutter to go along with nasty breaking stuff. He would slot perfectly into the eighth inning role. Grilli, Frasor, Lindstrom, and Padilla are all power arms, which is what the Brewers are looking for this offseason. Anyway, Rodney is by far the best name on the list, but he’s going to draw far too many suitors for the Brewers to compete with; same goes for Soriano. I wouldn’t be completely opposed to bringing Hawkins or Saito back on one-year deals, but health is obviously an issue for both of them at this point in their careers. I also wouldn’t mind seeing Villanueva in a Brewers uniform again, but he’s reportedly looking for a job as a full-time starter. If it weren’t already obvious, the guys the Brewers need to stay away from include Durbin, Jenks, and Qualls. Lastly, here is the list of lefty relievers on the market. Seeing as Manny Parra might not be back next year (and he wasn’t effective as the only lefty in the bullpen anyway), I’d like to see the Brewers pick up at least one of these guys. Two of these lefties- Burnett and Choate- would be nice additions for the Brewers, but both are more than likely going to re-sign with their current teams. I’d love for the Brewers to sign Howell- which they are probably capable of doing- but the market for him is reportedly at least eight teams. Feliciano, however, could be a very interesting option. He hasn’t pitched in the Majors since 2010 with the Mets due to injuries. But, before that, he was one of the best lefty specialists in the game, and led the league in appearances from 2008-2010. 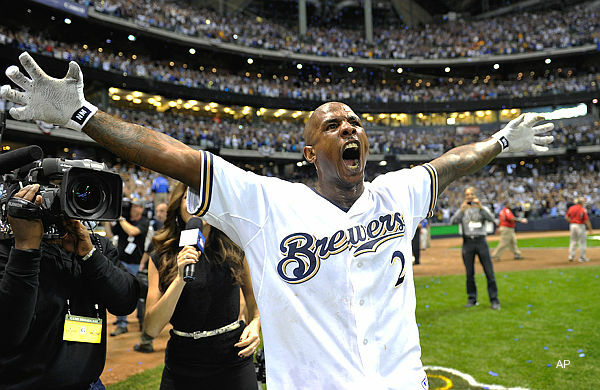 Even though there are some question marks surrounding him, he might be the best option for the Brewers. The bottom line is the Brewers need to add at least one or two of these relievers, but there are certainly more than enough to choose from. Indians: Signed Nate Spears and Jose Flores to minor league deals. I didn’t look much at news today because I was busy, but here was the first thing I saw when I finally did- “Brewers decline Betancourt’s option.” My day was instantly made. That’s right, Yuniesky Betancourt-haters (including myself). He probably won’t be playing shortstop for the Brewers next year, which means better defense at that position and better offense in the lineup- hopefully. Betancourt had a pretty bad 2011. But it may have been good for his standards, actually. He hit .252 with 13 home runs and 68 RBI. All of those stats are worse than his 2010 season with the Royals, in which he hit .259 with 16 home runs and 78 RBI. Anyway, if you add his 2011 stats to his lazy defense at shortstop, you can see why the Brewers declined his option. My guess is that Doug Melvin will make a push for Jose Reyes, the Mets’ All-Star shortstop who is now a free agent. His .336 batting average won him the NL batting title (although he technically cheated to get it). Reyes doesn’t hit for much power, but he did lead the NL in triples with 16. His offense, defense, and speed all make him a giant upgrade from Betancourt. Oh yeah, and the Brewers are also expected to be top contender for lefty starter C.J. Wilson. He went 16-7 with a 2.94 ERA as the ace of the Rangers this year, but he had an ugly postseason, as he went 0-3 with an ERA hovering around 7.00. But, he would make a great addition to the Brewers’ rotation, and would probably push lefty Chris Narveson (11-8, 4.45 ERA) back into the bullpen. And just a couple more things before I move onto my next topic- the Brewers’ declined reliever Francisco Rodriguez’s $17.5 million option, but that was expected, as there was no way the Brewers would have been able to afford that. Also, Dale Sveum is going to be interviewed as one of the possible managerial candidates for the Red Sox. No idea why they’d want him, unless they’ve already given up on next year.